This project created what might be called the biggest magazine rack in the world. 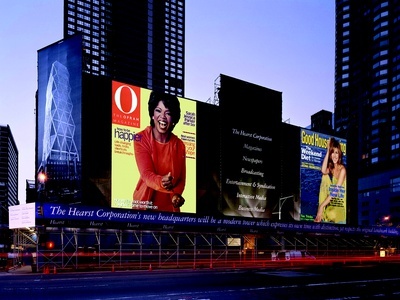 This construction barricade for Hearst incorporates billboard-sized representations of the covers of the organization's current magazines, changing as new issues hit the stands. Planned in collaboration with the Hearst Corporation and Tishman Speyer and designed at Chermayeff & Geismar Inc.